The author discusses the importance of training individuals (especially the young folks in the church) to go out and share their faith. Again, it’s important to think deeply about the Adventist brand of witnessing and compare it to the way witnessing is done in the non-Adventist realm. 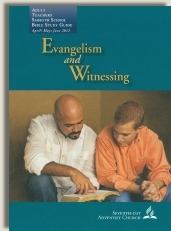 Witnessing is the process by which Adventists convert individuals to their 28 fundamental beliefs and prepare them for entrance into their denomination. Because non-Adventist Christians already believe in Jesus and the authority of Scripture, it is arguably more convenient to focus proselyting efforts on them. Adventist doctrine probably feels more foreign to a secular person/non-Christian than it does to a genuine believer in Jesus because Christians understand the history and importance of the Ten Commandments—the doctrine on which all the other Adventnist teachings hinge. Adventists must cover a lot more ground with secular persons than with someone who is already a believer in preparing them to accept the stipulations of membership. With a secular individual, Adventists cannot rely on the Bible as a starting point and foundation for discussion. The path of least resistance in terms of Adventism's successful witnessing is to proselytize those who are already believers in Jesus. This is where the Adventists focus most or all of their evangelistic training resources. Personally, I have never seen an Advnetist evangelistic series geared toward non-Christians. However, even with Christians there are barriers for Adventists to overcome in convincing them of the Adventist teachings. New Covenant Christians will not want to be put under any part of the Mosaic Law (see 2 Cor. 3). 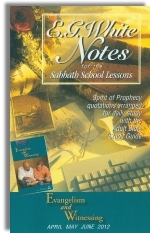 Even if they cannot clearly articulate Biblical reasons for resisting the Sabbath, many times it just doesn’t feel right to them; or they simply do not wish to make Sabbath (as Adventists teach it) a part of their lifestyles. For mainstream Christians, the concept of witnessing is very straightforward: to proclaim that by nature we are dead in sin and in need of a Rescuer; and Jesus fulfills that need. Then they ask individuals to believe on Him and follow Him. In this endeavor, there is typically no agenda to persuade individuals to join a particular denomination. There is no urgent need to study and properly interpret prophetic books like Daniel or Revelation. Mainstream Christians generally consider the Gospels and Epistles as sufficient for understanding Jesus’ life and work. Prophetic and historical books are helpful, not for (a) knowing and predicting the future or (b) giving us rules to live by, but as supplementary resources for more fully comprehending Jesus and His finished work. Thus, the end goal is not to present new information to help folks to 'be ready’ for Jesus’ coming. Rather, knowledge of Him is the goal. In summary, the following table sums up the differences between Adventism and non-Adventism in terms of Adventism's methods of witnessing. Presenting evidence to non-Christians for why they should believe the claims of Jesus. Persuading Christians that they are not complete in Jesus until they keep the Sabbath. Announcing to non-Christians that we all are by nature under God’s wrath, and the only solution for reconciliation to God is in Christ (Romans 1-5; Colossians 1:20-21). Persuading Christians that the Sabbath is (or will be at some point) the litmus test for salvation. Persuading non-Christians that being born again is the litmus test for salvation (John 3:5-8). Priority is persuading people to find the truth and beauty of the Sabbath. The purpose of prophesy is primarily for looking forward. Specifically, to teach Christians what will happen in the future; so they will not be deceived by the Mark of the Beast and Sunday worship. The purpose of prophesy is primarily for looking back, so both Christians and skeptics have evidence for verifying Jesus’ identity and building trust in His promises. Relaying to Christians that they must climb up to God’s standard by exerting their free will to follow His Commandments. Focus is on what we must do. Focus is on what Christ has done.